Not your average dog boarding facility! Paws Pet Resort & Spa in Cheshire, CT is a high-quality, full-service pet resort with pet-owning and pet-loving caregivers who will treat your pets like family, giving them the expert care and attention they require and deserve. We are conveniently located at 312 E. Johnson Ave about 1/2 mile from Route 10 and 1 mile from I-691. 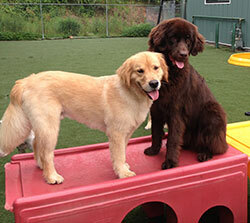 We proudly serve pet owners in the entire area including Meriden, New Haven, Waterbury and Hartford. Our Standard Overnight Lodging starts as low as $45.95 per night. Call us today to customize your pet’s stay! We know you need to leave your dog with someone you can trust. 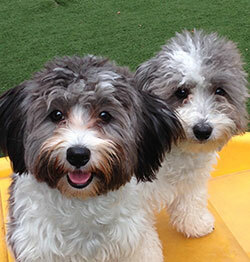 Our professional and caring dog boarding staff is here to deliver the best care possible. We are recommended by leading area veterinarians and highly recommended by our customers in formal surveys and local reviews sites like Google and Yelp. We’ve even been featured on Better Connecticut’s Channel 3 news and Connecticut’s Channel 8 news. Our staff has the most advanced, formal pet care training under the Outstanding Pet Care Learning Center guidelines, to ensure the highest standards of safety and care in the area. 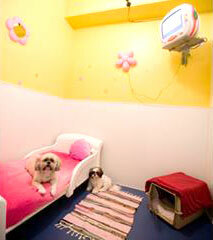 Let us pamper your pet with our luxurious accommodations. Our entire facility is heated and air conditioned with relaxing music played throughout. Rooms are cleaned daily, and tidied as often as necessary to assure our guests comfort and cleanliness. All of our cleaning products used in the play and overnight areas are environmentally green to ensure the best care and safety for our guests and to protect the environment. Providing a well maintained environment makes your dog’s stay with us comfortable and fun. Our dog guests are served two nutritious meals a day. You are welcome to provide your dog’s favorite food during his stay. Should your dog have special needs or dietary restrictions, we will provide a feeding schedule tailored to their special needs. Dog boarding fee is the same regardless of food choice. All guests, regardless of room or package choice, will be exercised at least two times per day to stretch their legs, do their “business” and interact with a caring friend. We know each pet is unique and owners know their pet best. So we keep our base lodging rate as low as possible, and allow you to choose the customized level of activity that’s best for you four legged friend boarding with us. Our experience has shown that high levels of physical activity and interaction result in happier and healthier pets–especially when they’re away from home. So we’ve taken our most popular activities and created discounted activity packages that you can choose from. Call us for more information. Choose from a variety of suites to fit the individual needs of your pet. Our spacious luxury suites are fit for a King and come complete with plush bedding, TV, and web cams so you can check in on your fur-baby while you are away on vacation or at work. Reserved for our guests 20 pounds and under are our Mini-Mansions, each with a different mural and their very own lounge area featuring a flat screen tv and a leather sofa. We also have multi-room suites (2-4 rooms) with radiant heated bedroom floors. The entire facility is air conditioned and heated with relaxing music played throughout. Our standard suite is perfect for your large or small breedand includes a comfy 4’x 6’ bedroom with a 4’x10’ private outdoor exercise/patio area. Perfect for larger breeds or more discerning pups, our extra large suite has a comfortable 6’x 6’ bedroom with a 6’x10’ private outdoor exercise/patio area. Perfect for dogs of the same family that love to play together but may need to be separated when they eat or sleep. Our family suites feature two or three 4’x 6’ bedrooms connected to a large 6’x12’ private outdoor exercise/patio area. Our King and Queen suites are like a room in your home. Each feature an overhead fan, plush bedding and individual televisions. The Luxury Suites also have webcams* so you can check in on your fur-baby while you are away. Luxury suites include a comfortable raised bed with plush bedding, maid service, room service with up to three meals per day, Our Queen suites feature a 6’ x 7’ room. Our King suites feature a 8’ x 8’ room. Our Mini Mansions are reserved for dogs 20 lbs and under. Many of our smaller guests prefer a den–like environment and enjoy the extra activities and handling that are included. We have eight mini mansion suites, each feature a different resort themed mural and tempered glass doors. They have their own lounge area with a leather sofa. The Mini Mansions are in a separate area just off the play gym for easy access. The Mini Mansions include a comfy bed, maid service and room service. Our Mini Mansion Suites are approximately 3’ x 4′.